I don’t know what it’s been lately, but I’ve been having a bad run of trying out new albums and completely hating them. Hence the lull in posts here. It’s all the more refreshing when a tried-and-true standby like Metric come out with a top-notch album to get me excited about records again. My love of Metric stems from the fact that they so perfectly embody what I want from my (non-mopey) music: catchy melody, fast percussion, punchy vocals. You’ve got this in spades on the first three tracks of Synthetica, ‘Artificial Nocturne’, the lead single ‘Youth Without Youth’ (which has really grown on me), and finally ‘Speed The Collapse‘. The song is remotely industrial, to my ears, and does a good job capturing the sinister aspect of the central theme of the album, with its “oceans boiled, and rivers bled.” As to what the hell a “comedown of revolving doors” is, I have no clue, but “fate, don’t fail me now” is a kickass chorus, as well as a not-so-subtle callback to the opening track that features an identical lyric. The synthesizers drone in the background while a slow marching drum beat pulls you through the track. For how slowly paced and simply constructed the song is, I’m blown away by how functional it is at this point in the album. The back end is impressively strong too: ‘Lost Kitten’ is a curiously warm-sounding track for how dark the subject matter seems to be, with Haines falsetto perfectly executed. ‘The Void’ and ‘Synthetica’ make up a closing power-pair, with the latter in particular being a boon as well as a namesake for the album, before ‘Clone‘ begins the dénouement. We haven’t heard this side of Metric (a slower tune that isn’t forlorn/depressed) since Old World Underground, Where Are You Now?‘s ‘Love Is A Place’. Sure, nobody’s going to be screaming the lyrics to this one at shows, but it offers a rare moment where Haines’ voice is just allowed to be beautiful, untinged with any biting edge or bitter sorrow. Everyone tends to have an opinion about the Lou Reed aided track, ‘Wanderlust’. Mine? Would have been better as a B-side. The abrupt change in tone from ‘Clone’ to ‘Nothing But Time’ makes the album tighter, and leaves the listener ever so slightly unnerved, which given the topic of the record seems appropriate. Synthetica is right up their with Fantasies in terms of quality of material while still being a clear and deliberate evolution in sound. 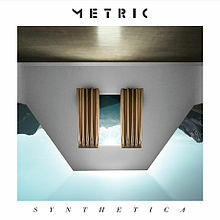 Metric is an outfit that essentially does everything right, and I could hardly ask for a better album from these fine folks.